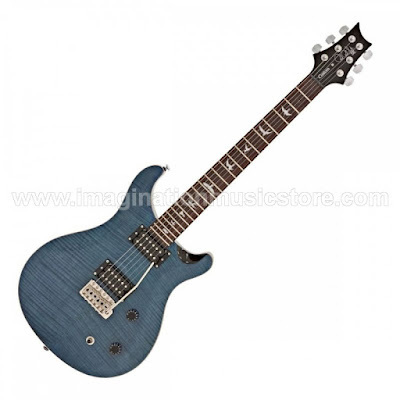 The PRS SE Custom 22 is an incredible value. This superb solidbody electric guitar gives you classic PRS playability while serving up vibrant humbucker tone from its pair of PRS 85/15 S pickups. This gorgeous instrument has a comfortably contoured mahogany double-cutaway body topped with eye-catching maple. The guitar sports a satisfying Wide Thin profile neck with a rosewood fingerboard, 22 frets, and classic PRS Bird inlays. The headstock has been redesigned to now sport Paul Reed Smith's signature, adding extra "cool" factor. The guitarists here at Sweetwater are big fans of the PRS SE Custom 22. Get your hands on it, and you will be too. The two humbucking pickups in this SE Custom 22 are Paul Reed Smith-designed 85/15 S humbuckers. An update on PRS's original humbuckers, the 85/15 S pickups are designed to be a fantastic choice for a wide variety of music and playing styles. They offer you plenty of output for driving your amp hard, while sounding clear and detailed when you want. These SE humbucker closely resemble the tones of the U.S.-made versions found in the solidbody electric guitars crafted at PRS's Maryland factory. To give this PRS SE Custom 22 solidbody electric guitar a rich yet balanced sound, PRS began by choosing the tried-and-true combination of mahogany topped with maple. This instrument's mahogany body offers natural tonal warmth, which is offset perfectly by the brighter tone of its maple top. These tonewoods join forces with the guitar's 85/15 S pickups to deliver a balance of depth, snap, and great midrange projection that propel you through the mix. Wrap your hand around the SE Custom 22's Wide Thin profile neck and you'll understand why it has been a favorite among guitarists in every genre for years. Because it's where your hands meet the instrument, neck shapes are critical to your playing experience. Paul Reed Smith takes this into very careful consideration when designing all of their neck profiles. The Wide Thin neck carve is very comfortable for players desiring a faster feel than the Wide Fat, while maintaining plenty of wood for optimal sustain.